Hacienda Motel is situated in the heart of Palmerston North in a quiet street near multiple cafes, restaurants and bars. We absolutely pride ourselves on customer service and cleanliness of all our rooms in a genuine friendly environment. Hacienda Motel offers a full range of accommodation options from ‘Studio Rooms through to Three Bedroom Apartments’ - suited to corporate business, travellers, couples, families, work crew, sports teams, dance groups, larger groups. 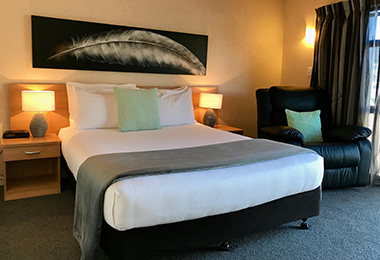 Included for all guests FREE UNLIMITED WIFI, 50+ Sky TV, Free on-site parking Our Four Star Plus Palmerston North motel has 17 smoke-free motel units including large family size apartments. The rooms all have fridges/microwave’s/toasters & kettles – some rooms have full size kitchens & family size fridges & ovens, some studios have kitchenettes with hotplates only. If you feel like breakfast - we offer Smoothies, Full Cooked or Continental Breakfasts - see reception for details. The breakfast can be delivered to your room in the morning at an agreed time. If you feel like going out for breakfast - we are spoilt for choice - there is The Local Cafe, Columbus Cafe, Arrosta Coffee, Joe's Garage, Cafe Brie - all in walking distance from The Hacienda Motor Lodge. Hacienda is also the closest accommodation to the Crest private hospital and Palmerston North boys’ high school. We are across the road from City Doctors Medical /Afterhours medical centre pharmacy. We will tell you of local events on Arrival. If you have any questions please call/ email. We have a range of accommodation options available at Hacienda Motel. 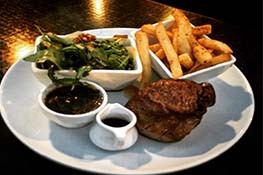 The Hacienda is within walking distance to the best Cafes Restaurants and Bars in Palmerston North. We have always found this motel excellent. It has a nice quiet location with lovely friendly hosts. It is always clean & tidy. We stay here once or twice a year and are never disappointed. Only a 5 minute walk from town. Easy access and plenty of parking.